Junko Tabei is the first woman to climb Mount Everest. Junko Tabei is a Japanese mountain-climber, reached the summit of Mount Everest on May 16, 1975 via the South-East Ridge route. Junko born on September 1939 in Fukushima, Japan. She completed English literature from Showa Women's University. She was married with 2 children. She is the founder of "Ladies Climbing Club: JAPAN (LCC)" in 1969. 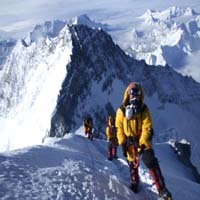 After a long training period, they began the Everest camp expedition early in 1975. They traveled to Katmandu and took guidance of local people over there. They used the same route Sir Edmund Hillary and Tenzing Norgay took in 1953 to reach the same. An avalanche struck their camp and made junko unconscious. The locals helped her to back to normal. Finally she reached the Everest about after 12 days travel after this incident. Since then, she has climbed many mountains all over the world including Everest.